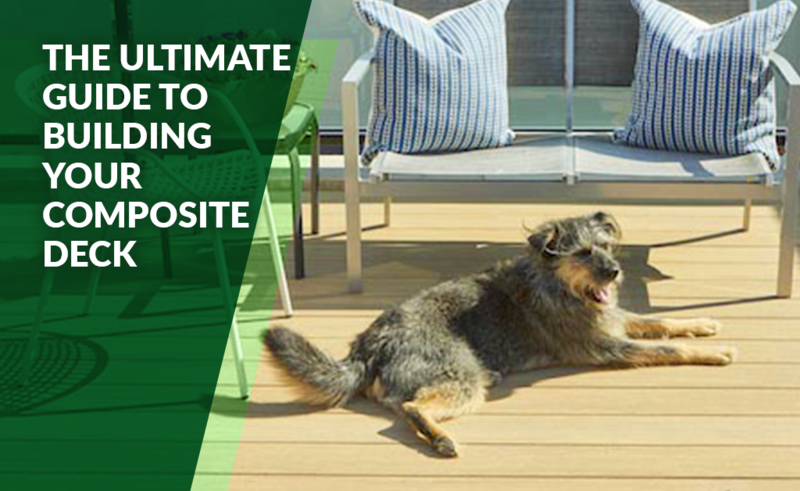 Easy to maintain and quick to install, composite decking offers an alternative to natural wood decking that doesn’t sacrifice the look and beauty of the real thing. It’s a premium option that comes with a higher initial price tag, but its durability means fewer repairs and replacements down the line, which can end up saving you money (and time…and frustration…) in the long run. 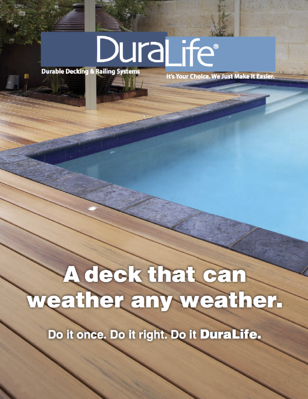 Learn more about the benefits of composite decking here. Whether you’re upgrading your old, warped and splintery deck with better materials, or you’re building a new deck from scratch—there’s a lot to consider and plan before you get started. We’ve put together this series to help you get your project off on the right foot! In Part I, we’ll cover all the things you should consider when planning the layout of your deck, and how to select the right products for your project. Then next time in Part II, we’ll cover installation and maintenance. The best way to get started on your new deck is to draw a little inspiration from others. We recommend starting on a site like Pinterest or Houzz where you can save images and ideas that you like and come back to them later. To get a good idea of what will work best for your home and neighborhood, do a search for decks based on the style of your house. It’s important to consider not only what you like, but what you don’t. Be sure to pay attention to small details as well, such as lighting and stairs. And remember, railing is a big part of your deck too! Start thinking about what styles you like early on—don’t leave it as an afterthought. Chances are you’re building a deck for a specific reason, whether you need a spot for a new hot tub, or just a quiet space to unwind after work. 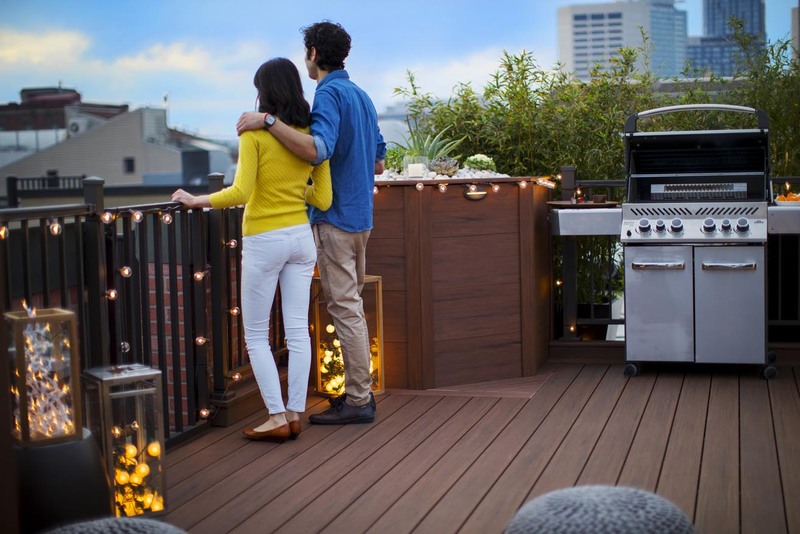 To get the most out of you deck, consider what you want to use it for—this will help determine how much room and what features you’ll need. How Much Space Will You Need for Your Deck? If you plan to eat dinner out on your deck when the weather’s nice, you’ll want enough room for guests to get in and out of their seats comfortably. This Old House recommends leaving at least 4 feet around the table, so people can walk around those who are seated without knocking the fork out of their hand—good advice! If you anticipate hosting a lot of get togethers, consider adding built-in benches. They’ll eliminate the need to buy extra chairs (and haul them in and out of storage) and will free up space for your guests to mingle. Wide railing can also give guests a convenient place to set their drinks on. A Sunny Spot or a Shady Space? If you like to bask in the sun or do yoga out on your deck, consider a ground-level platform-style deck that gives you plenty of room and doesn’t require railing, which could potentially block your sun if you’re lounging low to the ground. If you’re not the sun-bathing type, a shelter such as a pergola or awning will give you some extra built-in shade. You can even build your deck around your favorite shady tree, provided it’s in good shape. Just be sure to leave adequate space around the tree so it has plenty of room to grow. Will You Need Privacy on Your Deck? For homeowners with small lots, a fenced off deck can add privacy that can be hard to come by in tight neighborhoods. Some neighborhoods, however, have strict rules governing what types of fencing you can use on your property. If adding a fence isn’t an option, lining your deck with planters filled with ornamental hedges is an easy way to add privacy, and will instantly add life and charm to your deck for an upscale look. 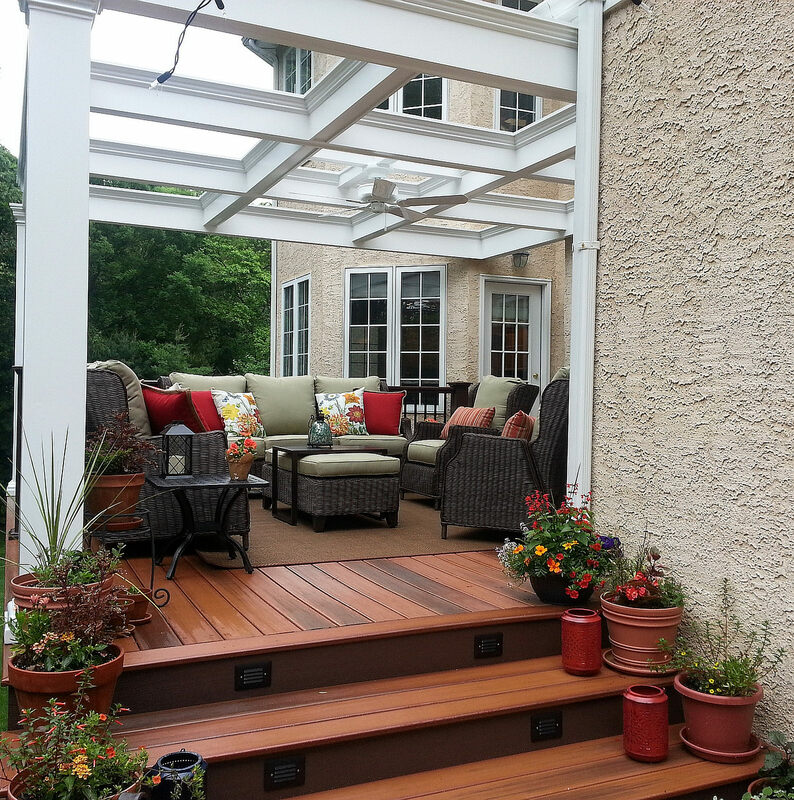 How Much Structural Support Does Your Deck Need? Too many homeowners forget to take into account the weight load of furniture and guests when considering what structural support they’ll need for their deck. Decorations like planters can be deceptively heavy—especially after adding soil and rocks. And if you live in Iowa or other parts of the Midwest that regularly see a lot of snowfall, don’t underestimate how much weight a few feet of snow can add! 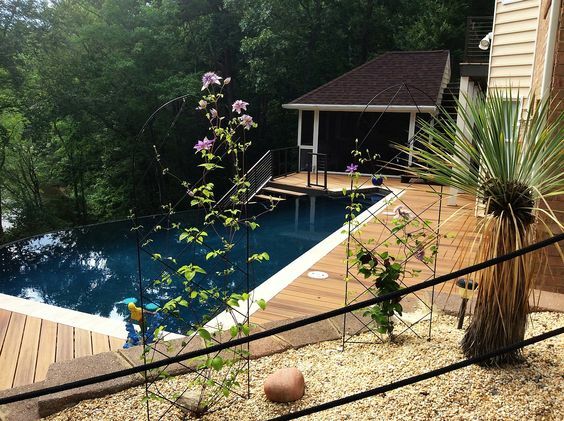 For the most part, we recommend allowing a normal deck will safely accommodate around 75 lbs. per square foot. Depending on your local building codes, you might be restricted from adding features like fire pits to your deck. Regardless of your design or the features you choose—you’ll need to consult these codes anyway. 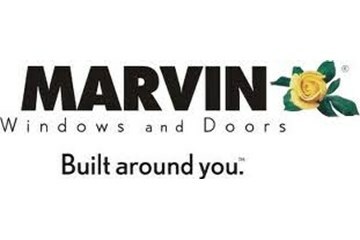 If you live in Linn County, you can find them here. Certain neighborhoods also have their own regulations and restrictions that you should consider before finalizing your plans. These could range from restrictions on height and certain materials, to guidelines governing the overall look and feel of the structure. As a general rule of thumb, if your design feels out of place for your home or neighborhood, it’s time to go back to the drawing board. If you’ve done your homework and have kept notes on what features, colors and styles you like in a deck, selecting your products will be much easier. 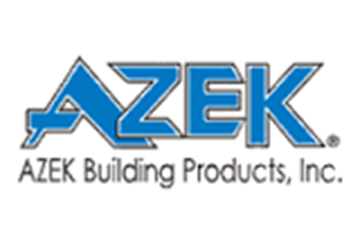 In addition to looking at examples online, check out a few different product catalogs to get an even better sense of what you’re interested in. And be sure to visit a showroom in person so you can hold the product in your hand to get a feel for quality. 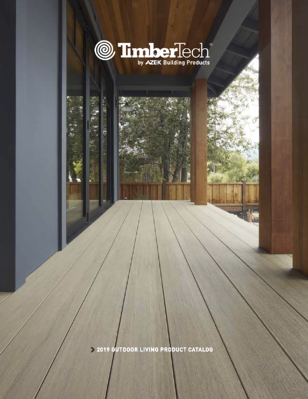 We always recommend taking a sample, paint swatch, or photo home before you make your final purchase to make sure the color matches or complements your home and that you’re confident you’ll love your new deck before installation gets underway. 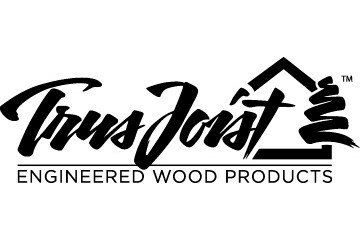 At the Suburban Lumber showroom, experts are on hand to answer your most detailed questions about your upcoming project. We can help you price out your options, give you handy pointers for installation, and teach you how to maintain your deck once you’ve installed it. Tune in next time for Part II, where we’ll cover installation tips and how to care for your deck once you’re finished.